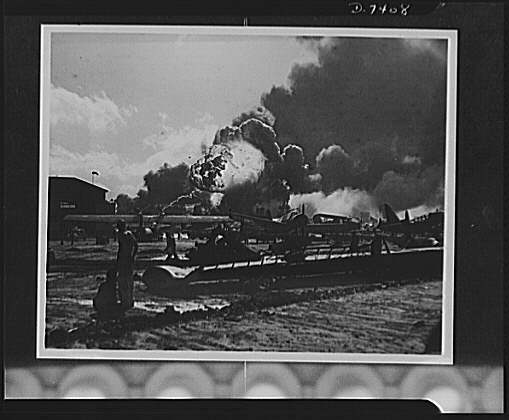 This photos on this page show views of the devastating attack by the Japanese, on the U.S. Navy Ships, and military personnel at Pearl Harbor. This photo shows Battleships USS West Virginia and USS Tennesee on 12/07/1941. This photo shows from left to right USS West Virginia , USS Tennessee , and the USS Arizona. 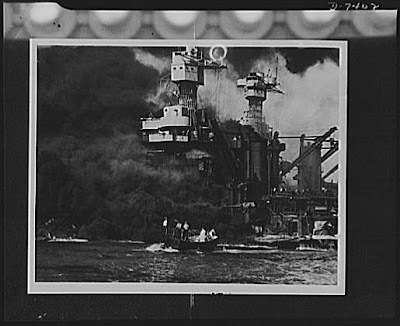 This photo shows a small boat trying to rescue sailors from the burning USS West Virgina. The USS Tennessee is next to her. 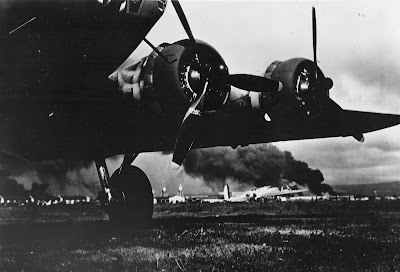 This photo shows Ford Island Naval Air Station, Hawaii, 12/07/1945. Right, USS Arizona in flames. Left, colors flying from the USS West Virginia. Battleship row after the attack. The USS California being abandoned, while on fire, and stating to sink. 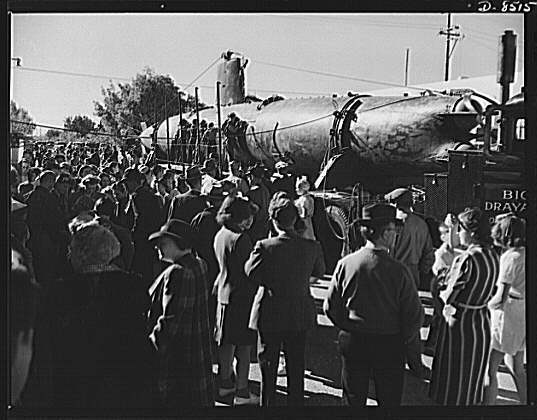 The USS Shaw's magazine exploded, causing this amazing fireball. USS Arizona sinking and in flames. Part of the wing from a Japanese airplane that landed on the grounds of the Naval Hospital. This photo shows oil burning on the surface of the water, near the Naval Air Station. This Boeing B-17D sits on the ground at Pearl Harbor on Dec. 7, 1941. In the background, you can see smoke from the burning ships. This photo shows the devestating destruction at a Naval Air Base at Pearl Harbor, Dec. 7, 1941. The U.S. used the attack on Pearl Harbor as a motivation in posters, such as this one titled "Avenge Pearl Harbor". Our bullets will do it.